Building on the Extra Virgin category from below, the Ultra Premium standard raises the bar and exceeds ALL current standards for the Extra Virgin category. Free Fatty acids cannot exceed 0.3% (0.3 grams per 100 grams, expressed as oleic acid), the oleic acid monounsaturated fat content must be greater than 65% (current IOC standard is 55%), the peroxide value must not exceed 9 mEq O2/kg oil (current IOC standard is 20), lower K-values which measure UV absorption rates, the "Fresh Pack" test which measures DAGs (diacilglycerols) and PPPs (pyropheophytins). All UP oils will also have a minimum Polyphenol measured content (at time of crush) of not less than 130 ppm (mg caffeic acid/kg). To see a more detailed explanation of these criteria and their benefits please click here: Ultra Premium Extra Virgin Olive Oil and your Health. 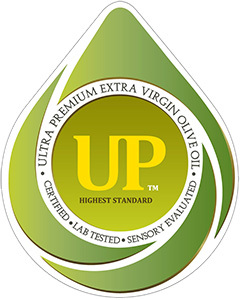 Within the "Extra Virgin" category and with superior chemistry of Ultra Premium designations - HPOO or High Phenolic Olive Oil (High Polyphenol Olive Oil) refers to a special category of olive oils that are the result of crushing early harvest green olives which yield the highest levels of phenolic compounds. These olive oils are high in the desireable healthful phenolic compounds, and they stay fresh and vital for longer periods of time. The oil that comes from the first "pressing" of the olive solely by mechanical or other physical means, and is extracted without using heat (a cold press) or chemicals. The oil must not be altered in any way. It can only be treated by washing, decanting, centrifuging and filtering. Extra Virgin Olive Oil contains no more than 0.8% acidity (0.8 grams per 100 grams, expressed as oleic acid), and is judged to have a superior taste. The less the Olive Oil is handled, and the closer it is to its natural state, the better the oil. If the Olive Oil meets all the criteria, it can be designated as "extra virgin". It must have no flavour or aroma faults. NOTE: All of our extra virgin olive oils registered an acidity of less than 0.3% at the time of crush, and the majority falling between 0.1 and 0.2%. Virgin Olive Oil which has a free acidity of not more than 2.0% (2 grams per 100 grams expressed as oleic acid) and the other characteristics which correspond to the extra virgin category above. Virgin Olive Oil which has a free acidity, expressed as oleic acid, of not more than 3.3 grams per 100 grams (3.3%) and the other characteristics of which correspond to the extra virgin category above. Ordinary oil may still be fine for frying or where flavour is not wanted or needed. This is Olive Oil that not fit for human consumption as it is. It will have a free acidity, expressed as oleic acid, of more than 3.3 grams per 100 grams (3.3%). Used for many years in oil-burning lamps. This is a blend of virgin and refined production oil, of no more than 1.0% acidity (1 gram per 100 grams expressed as oleic acid). It commonly lacks a strong flavour. The cheap refined oil is mixed with flavourful virgin Olive Oil. Pomace is the ground flesh and pits after pressing. It has a free acidity of not more than 1.0% (1 gram per 100 grams). It is considered an inferior grade and is used for soap making or industrial purposes. Olive cake is the solid phase that's remained after pressing olives. Also called pomace. "Light" Olive Oil is a marketing concept and not a true classification of Olive Oil grades. It is not a regulated designation so there are no real parameters for what its content should be. Sometimes, the Olive Oil is blended with other vegetable oils. It is important to note that this designation refers to flavour only, not caloric content, as all types of Olive Oil have the same number of calories. This oil is often flavourless and of low quality. It is a refined oil. This refers to the combining of Olive Oils from different groves, varieties, and qualities (sometimes from different countries also) to create a blend that offers a desired taste. Changes in weather and other conditions will impact the same olive variety in the same region differently every year. Since large supermarket brands must taste the same year over year, “master blenders" are employed to create a recipe that combines these different oils from different sources to create the same finished product consumers associate with a particular brand. Another reason for blending is to increase an oil’s shelf life. This is achieved by blending an oil high in polyphenols with one that does not. Sometimes Olive Oil is blended with canola or other vegetable oils. This is legal ONLY IF STATED on the label. Illegal blending of cheaper hazelnut oil can be profitable for the dishonest producer and is difficult to detect. Olive Oil produced in a holistic, ecologically-balanced approach to farming, without the use of any pesticides or chemicals. It is important to note that many Olive Oils may be organically produced, however the high cost of certification is often prohibitive for small independent producers. For this reason very few oils will actually be certified organic. Some of the more common certification agencies granting the organic designation include BIOHELLAS, ECOCERT, USDA ORGANIC, DEMETER, ICEA, and DIO, although there are many more. Unfiltered oil will contain small particles of olive flesh. While some claim this adds additional flavour, it often causes sediment to form at the bottom of the bottle. There are varying degrees of filtration (partially filtered, lightly filtered, etc), but this sediment may become rancid. This will over time deteriorate the oil’s flavour and shelf life. Unfiltered oil should be properly stored and used within 6 months of bottling. We recommend that unfiltered oils are best enjoyed drizzled over salads or grilled vegetables, and not for cooking. Olives reach their full size in the fall but may not fully ripen from green to black until late winter. Green olives have slightly less oil, more bitterness and can be higher in polyphenols. The oil tends to be more expensive because it takes more olives to make a bottle of oil. Many people like the peppery and bitter quality of early harvest oil. Flavour notes of grass, green, green leaf, pungent, astringent are used to describe early harvest fall oils. Because of the higher polyphenols and antioxidants, early harvest oils often have a longer shelf life and may be blended with late harvest oils to improve the shelf life of those late harvest oils. The fruit is picked black and ripe. The fruit may have a little more oil but it is risky because waiting longer into the winter increases the risk the fruit will be damaged by frost. Late harvest or "Winter" fruit is more ripe so like other ripe fruit it has a light, mellow taste with little bitterness and more floral flavours. Flavour notes of peach, melon, perfumy, apple, banana, buttery, fruity, rotund, soave and sweet are often used. These Olive Oils of increasing popularity have been infused or fused with herbs or fruits. Typically flavoured olive oils use a lower quality of olive oil or with blends including sunflower or canola oil, so you must be cautious about these and ALWAYS read the label. The Flavoured / Infused Olive Oils found in our site are all made from a base oil of ONLY ULTRA PREMIUM™ certified Extra Virgin Olive Oil. Our Fused olive oils are made by crushing early harvest olives together with fresh herbs or whole citrus fruit. This refers to olives that are literally individually picked by hand directly from the tree. The argument is that mechanical harvesting can bruise the fruit, which will result in a higher acidity, so to avoid this, olives are carefully picked by hand. Also referred to as "Hand Harvested". Oil labelled "Estate Olive Oil" means that all olives were harvested, crushed, and bottled in the same olive grove. These oils are usually produced in small batches and are sought after by consumers for their uniqueness in flavour and profile. Occasionally the term “Single Estate" will be used instead and means the same thing. These oils tend to be more expensive and can be of a higher quality. Oil labelled "Mono-Varietal" or “Single Varietal" means that only one type of olive was used to produce that Olive Oil. These oils are often desired for the enjoyment of the most “pure" characteristics and flavours of an individual olive type. Some Olive Oils may also have additional designations that certify their growing area of origin. These areas or zones, are determined by the European Union in 1992 to promote and protect regional food products within the EU. This has helped to encourage diverse agricultural production, protect product names from misuse and imitation, and has helped consumers by giving them information concerning the specific character of the products. Similar systems and designations exist in the world of cheese, and wine, (eg VQA wines in Canada). Protected Denomination of Origin – The Olive Oil must be produced, processed and prepared in a specific region using the area’s traditional production methods. For Spanish Olive Oils you may see DO or "Denominación de Origin". For French Olive Oils you will see AOC or "Appellation d’Origine Contrôlée". Protected Geographical Indication – This designation is slightly less stringent than PDO, but still requires that the product be produced in the specified geographical region. The geographical connection must exist for at least one stage of production, processing or preparation. If only one of the stages of production has taken place in the defined area, it still qualifies as PGI. As an example, the olives may come from another region. This allows for a more flexible connection to the region and can focus on a specific quality, reputation or other characteristic attributable to that geographical origin. In Italy, you may also see these oils labelled as IGP. Traditional Speciality Guaranteed – This designation highlights traditional character, either in the Olive Oil’s composition or in its means of production.